American consumers who eat conventional chicken have been consuming arsenic - a known cancer-causing chemical - for many years. A new scientific study suggests that poultry on factory farms are routinely fed caffeine to keep them active so that they can spend more time eating, active ingredients of Tylenol and Benadryl to reduce anxiety, banned fluoroquinolones antibiotics such as Cipro which produce superbugs to make them bulkier plus bacteria free and even arsenic because it reduces infections and makes flesh an appetizing shade of pink. Bird feathers, like human hair and fingernails, accumulate chemicals and drugs that an animal is exposed to. Scientists from Johns Hopkins University and Arizona State University examined feather meal — a poultry byproduct made of feathers and had intended to test only for antibiotics but instead ended up finding all these other chemicals also. 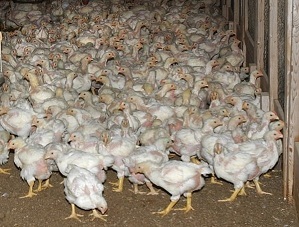 Almost 9 in 10 broiler chickens in the United States had been fed arsenic, according to a 2011 industry estimate. Even FDA admits that Arcenic is added to the chicken feed (and sometimes hogs feed) for a 'purpose' but agrees that the arsenic added to the chicken feed ends up in the chicken meat where it is consumed by humans. Although FDA claims that arsenic levels found in chickens are safe to eat while agreeing that arsenic is a carcinogen, meaning it increases the risk of cancer. Despite of safety claims by FDA, Dr. Michael Greger, MD, the NIH, and the USDA's Food Safety Inspection Service had indicate the alarmingly high levels of arsenic contamination in the flesh of broiler chickens is exceeding the EPA upper limit. Implication in this matter for farmers is that huge food companies require them to use a proprietary food mix which may contain all these chemicals, and the farmer typically doesn't know exactly what is in it. All in all, companies produce cheap food that saves us money for the moment but we all may pay more in medical ailments caused by these foods. A large dose of arsenic can kill outright, while chronic ingestion of small doses has been linked to a large range of cancers. At lower levels, arsenic can cause nausea and vomiting and decrease the amount of red and white blood cells produced by the body. It also causes abnormal heart rhythms, may damage blood vessels, and causes a pins and needles sensation in the hands and feet. Additionally, liver and kidney function can be affected. Retinol is used for chronic arsenic poisoning. Beta-carotene, ascorbic acid, alpha-tocopherol, folic acid, zinc, spirulina and selenium in combination are of benefit. Increasing the intake of foods rich in potassium and sulfur-containing substances in garlic to scavenge arsenic from tissues and blood. To know about chelating heavy metals from the body in detail, please click here.